We started to see it in Gainesville. After rough outings at both Pomona and Phoenix, and after a very useful test session on the Monday after the Phoenix race, Del Worsham’s Funny Car began its progression toward the sort of ultra-consistency one would expect out of a sportsman car with a dial-in written on the window with shoe polish. In Gainesville, it was uncanny. This past weekend in Las Vegas, it was even more so. Run after run. Gainesville saw the Kramer Service Group Toyota make five full laps down the Gatornationals track, all between 3.97 and 4.05. 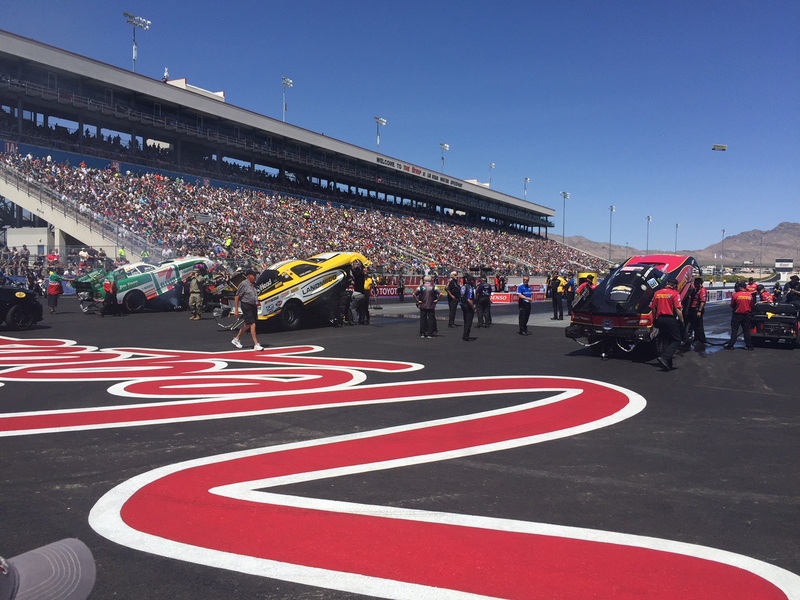 In Las Vegas, Del’s first run was thrown out because Cruz Pedregon slammed into the wall and inadvertently tripped Worsham’s timers. After that, it was 4.04, 4.09, and 4.07 during qualifying. That led to Sunday and 4-wide fun. In round one, Del’s Camry did smoke the tires well down track in round one, but it was enough to make him the second-quickest of the quad, so he moved on. Tim Wilkerson and Matt Hagan (who double stepped it and red-lit) were eliminated. The round-two quad featured Del, Tommy Johnson, JR Todd, and that John Force character. Del ran a strong 4.04 while TJ took the stripe first with a stronger 4.00. Both Force and Todd clocked in at 4.05, but they both got to the finish line before Del. JR’s 4.05 was the slower of the two, but his starting line advantage earned him a double hole-shot and he moved on with TJ. Del wasn’t as upset with the double hole-shot loss as he was sorry. His light wasn’t bad, it was pretty much his normal standard reaction time, but JR’s was really good. 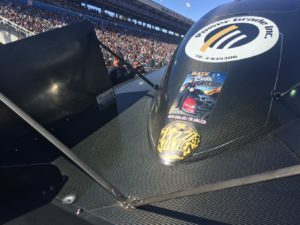 Del’s guys had worked so hard all weekend to give him nearly a flawless car while many of them were also pulling double-duty helping out on the Worsham Top Fuel car driven by Steve Chrisman. Del’s buddy JR just picked a whale of a time to pick his pocket at the starting line, and he then went on to win the race. As for that Top Fuel car, it also advanced out of round one, creating a scenario that could have put the entire team in real jeopardy. Del and Chuck run that car on a very strict budget, so it doesn’t have its own full crew. Who would work on it between rounds? The answer came from the Russo Racing Funny Car team. They came over, en masse, and pitched in to get it serviced with time to spare. Outstanding sportsmanship, right there, and much needed help. Del was actually pretty upbeat after the loss in round two, because the car was clearly running well enough to go on and do what JR did. It’s still ultra-consistent and now it’s getting faster and faster. It’s all good. And speaking of all good, that would be a very understated way of describing the crowds at The Strip all weekend long. It’s a huge place, probably one of the top five largest venues on the tour, in terms of capacity, and after a fine crowd on Friday we had back-to-back Sell-Outs on Saturday and Sunday. It was packed. The size of the crowds created quite a bit of buzz, even among the drivers and crew members who often have mental blinders on at the starting line. The packed grandstands were just impossible to ignore or miss. I’ll admit that the old sports franchise GM in me came out a bit during the week before the race. I took a look at the seat map for ticket sales and it was pretty obvious by Tuesday that the pre-sale for the race had been outstanding. And huge kudos to Jeff Foster and the entire staff at Las Vegas Motor Speedway. They had roughly five months to start with a two-lane strip, then tear that up and build four all new lanes. The only piece of the track that stayed was the left side retaining wall. Everything else was new, and every crew chief I talked to said they were the flattest and smoothest four lanes they’d ever seen. A remarkable effort by everyone involved. The weather was also pretty spectacular, as this first photo shows. We did get a few hours of strong winds on Saturday, but that’s pretty standard out there in the desert and we know how to strap everything down to keep things like EZ-Up tents and solvent tanks from flying away. It’s the “Dave and Buck Show” with special guests Gibson and Hudson. I’m just the staff photographer. On Sunday, we had all sorts of fun before the first round. The Hujabre family made their standard appearance, and we were fortunate to have them in the pit when Dave Rieff came by to see all of us. As I’m sure you can imagine, it was great to see Buck, Mary, and the boys and Rieff’s timing was spectacular. Many laughs and hugs were crammed into the 10 minutes he was there. He brought along two big stacks of various types of pizza and split the total in half to make deliveries to the Wilkersons and the Worshams. And a Wilber. His three favorite Ws. As for the pizza, yeah I may be a bit biased since he’s my friend, but I’m also a pizza junkie with firm opinions on what makes good pizza. The Pizza Kitchen pizzas were far better than good. They were great. The fact six large pizzas basically disappeared after they were put on tables in the pit area is all the proof you need. Really fantastic stuff. Pizza and an autobiography. The perfect pairing! Buck also had some decals made up and both Tim and Del put them on their cars. I thought it was pretty cool that we put The Pizza Kitchen decal adjacent to the “Bats, Balls, & Burnouts” decal on Del’s back window area. 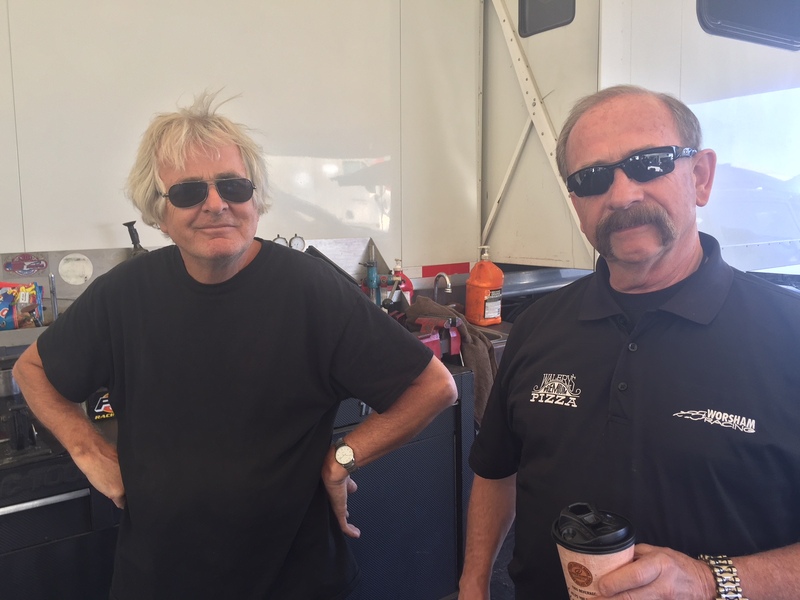 Two buddies who met because of the original version of this blog, and now we have two very important projects promoted together on Del Worsham’s Nitro Funny Car. How cool is that? Another noteworthy Vegas point was made by my newest watch and my iPhone. My new Fossil watch also tracks steps like a FitBit, and it then syncs with the Fossil app on my iPhone to show me how many steps I’ve taken each day. In Vegas I averaged around 9,500 steps per day. On Saturday I topped 10,000. Steps and distance are “related” but they’re also “relative” to each person’s stride. So, at the gym one day I walked exactly one mile (the track at the gym is 1/13th of a mile so I knew how far to walk) and when the mile was done the total number of steps was almost exactly 2,000. So, on Saturday in Vegas I walked a bit over five miles. That’s a good thing! All in all, I’d have to classify the inaugural Vegas 4-Wide race a roaring success. 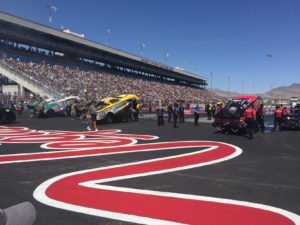 Great racing, tons of side-by-side-by-side-by-side dashes to the finish line, and attendance that absolutely dwarfs anything the spring Vegas race has ever seen. Bravo to everyone who made it happen and to the fans who packed the stands. As for me, away from the track, well you know I have a hard time resisting a good slot machine. I stayed at The Cannery the first three nights and on Thursday I hit a few big ones in just 20 minutes. I had the payout slips to prove it the next day at the track. Within 20 minutes I turned $400 into more than $1,300. It was hard to stop playing because it all happened so fast, but I walked away and put the payout slips in my wallet. I played a little on Friday night, but when I burned through most of the cash I had left, in a blink, I walked away again. My method for payout slips is to keep them locked up in my wallet until I check out of the hotel, so that I don’t cash them in and burn that money. On Saturday, I felt a good buzz in the casino and got some more money out of the ATM. I turned that $400 into about $800 in just a matter of minutes, hitting a couple of good ones on the Wheel of Fortune machine I played. I checked out of The Cannery on Sunday morning and cashed in my “earnings.” After the race I drove down to Mandalay Bay to be closer to the airport. I promised myself the only appearance I’d make in that casino was the walk I’d have to make going in and then leaving on Monday morning. I kept that promise. The rough math had me playing about $900 and then going home with a little over $2,000. All on silly machines with spinning wheels. 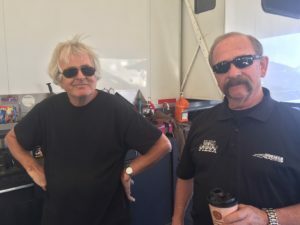 John Fink didn’t stay where I did, so we’d catch each other up on our wins and losses each morning, much to the amazement of Dave Walery, who was also there. Coincidentally, John and I did just about exactly the same, on the same nights, just 20 miles apart. We talked a lot about the early Worsham years when we stayed at the old Imperial Palace year after year. Back then, you could go to the cashier and buy racks of coins to actually put in the slot before you pulled the arm. Now, you go to the ATM and get big bills, which makes it far easier to blow your money. And finally, I shall leave you with this nostalgic photo. If you know Del Worsham’s history… If you’ve heard the stories from when he was just a 21-year old Funny Car driver already winning races and the Rookie of the Year award… If you’ve ever seen him, then or now, riding a wheelie through the pits… This is the famous baby-blue “Free Agent” BMX bike. The same one. All these years later. The day I met Del he was riding a wheelie through the pits. At some point, during the Vegas weekend, I guarantee he was doing the same thing. 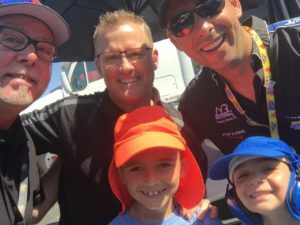 Del was really big into BMX racing, and he originally thought he might do that instead of drag racing, but all through his teens his dad was out there with the Funny Car and Del finally figured that his future was brighter on four wheels instead of two. But he never lost, sold, or gave away the bike. Yes, it’s one very historic bike. I’ll never forget the April Fool’s Day press release I put out back in the early 2000s when we were still living in Austin. I wrote it as seriously as any release I ever put out, with the dateline April 1 clearly printed at the top. Even with it being distributed on April Fool’s Day, I still suckered a couple of dozen people into believing that Del was quitting as a Funny Car driver so that he could go back to his real roots in BMX. 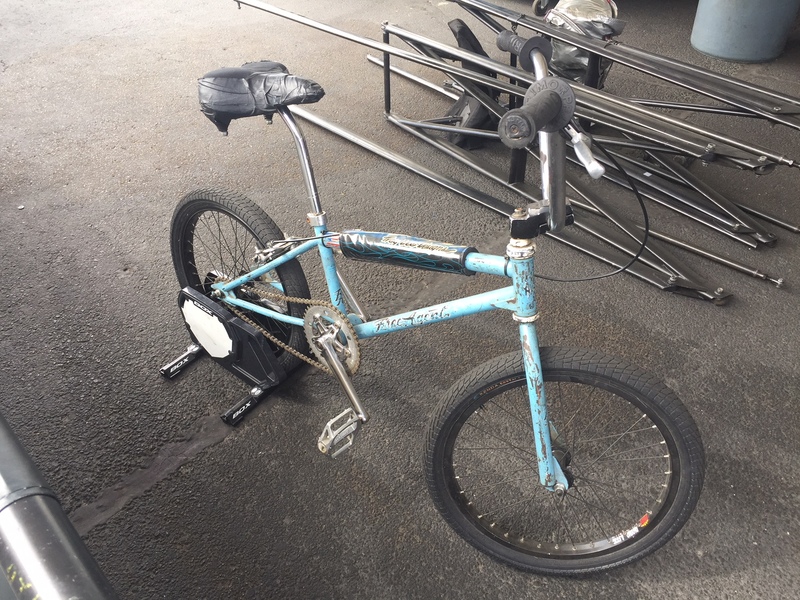 I think the line, “I feel bad for my crew because, obviously, I don’t need eight guys helping me work on this bike…” helped convince a few. I can’t top that prank, so I don’t even try these days. Well that’s about it for this week. Tomorrow, “Neighbor Dave” Jacobsen, Terry Blake, Mitch Martin, Joe Gillis, Scott Meehan, and your trusty blog writer will all be descending on the North Shore of Lake Superior, to have a “husbands weekend” at Joe and Scott’s condos up there. Joe had meticulously planned all sorts of outdoor activities, and also a private “Chef’s Dinner” at Scott’s place, but now the weather forecast is abysmal. One Twin Cities forecaster said “One of the models has this thing really going crazy. Rain, ice, snow, lots more snow, and wind.” Oh great. And, as always, if you just read this blog and liked what you saw, please click on the “Like” button at the top. Bob Wilber, at your service and heading for the North Shore!